Alright, I’m assuming that if I need a break from our recent discussions on chimps using spears, stress & primate physiology, ethics, and new species then so do you. So, to break the monotony here’s a set of entertaining and heart-warming videos of one of Little Rock Zoo‘s gorilla families. In the first video you will see Sekani, the mother, and Fossey, the big bad softy of a silverback dad, enjoying a play bout while 3 month old Mosi goes along for the ride. 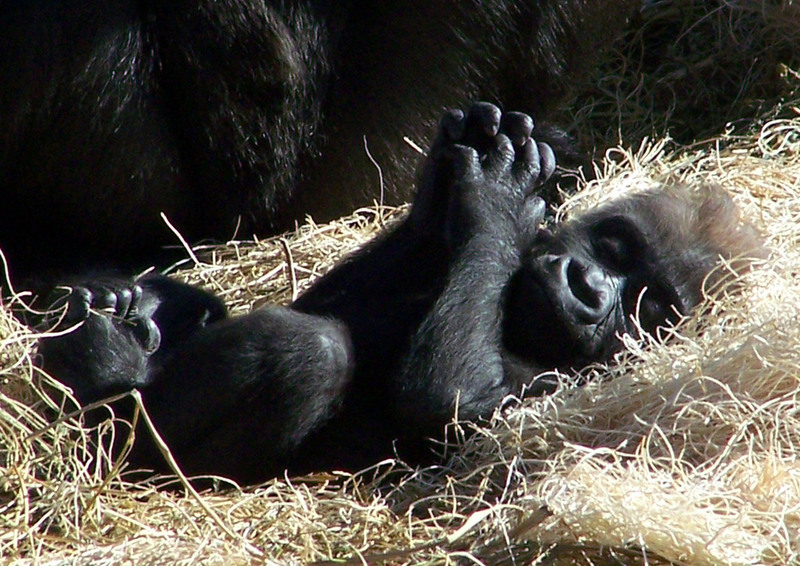 The second video, you will be seeing Fossey bonding with his little one. The videos show how gentile and docile gorillas can be to one another. Please thank Daphne Brock Pfeiffer, one of the gorilla keepers for uploading this to YouTube and sharing this all with us. There is also a photo album of the trio up over here, I especially like this tender moment between father and child here. Don’t expect this break to last very long, I’ll be posting about a new publication with reanlayzes the human divergence from other great apes, as well as a paper on primate brain evolution. Hi m y name is Jim Alldridge. I am a new Docent at the Little Rock Zoo. This is so amazing. Every time I go to work I get to see Fossie, Mosi and Sekani. Sekani is older now and doing great. He is full of spit and vinegar! This is very a very special video.